Enjoy country living in this well maintained 3 bedroom 2 bath home on almost an acre. The house is bright and cheery when you walk in to the new tile floors in the living room, dining room, kitchen and family room. Kitchen has all real wood cabinets, new sink and new tile backsplash. The three bedrooms have laminate flooring and new window coverings. The main bathroom has new tile around the tub, new tile floor and bead board on the walls. The master bathroom has a walk-in shower and a new tile floor. All windows have new window coverings. The air conditioner and drain field were both installed in June of 2016. Laundry room has washer and dryer with new tile floor. The property has 3 out buildings with electric. One is a block building that is 22 by 16 with cabinets and shelves.Easy access to Ocala and Gainesville. You can enjoy the Rainbow River for tubing or boating. 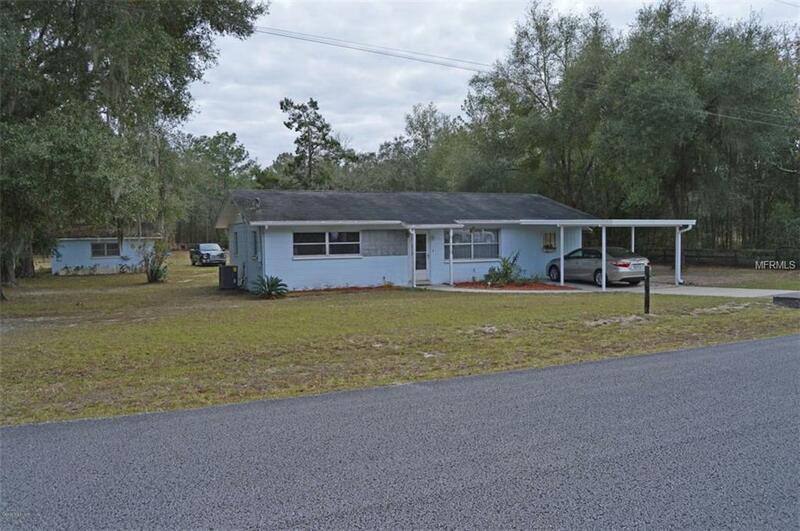 Close to the gulf for fishing out of Yankeetown or hunting or hiking in the Goethe National forest. Enjoy sitting under the oak trees, drinking your coffee and watching the wildlife: squirrels, rabbits, birds and an occasional deer or turkey. House comes partially furnished with washer, dryer, stove, and refrigerator.